In case you were wondering, former President Bill Clinton remains bad. Sitting with his arms crossed in front of his chest alongside a twitchy James Patterson, Clinton was visibly agitated during a line of questioning by NBC News’ Craig Melvin about whether the #MeToo movement has changed the way Clinton sees his affair with Lewinsky, who at the time was a 22-year-old White House intern, or the way he handled the impeachment proceedings. Spoiler: It does not! Also, did you know he hired a lot of women as governor of Arkansas? He wants you to know that. “Well, I don’t think it would be an issue. Because people would be using the facts instead of the imagined facts. If the facts were the same today, I wouldn’t,” said Clinton during the interview that aired on Today. He then suggested that critics are only bringing up his affair with Lewinsky again because they’re frustrated by inaction against President Trump and the many alleged sexual harassment and assault allegations made against him. 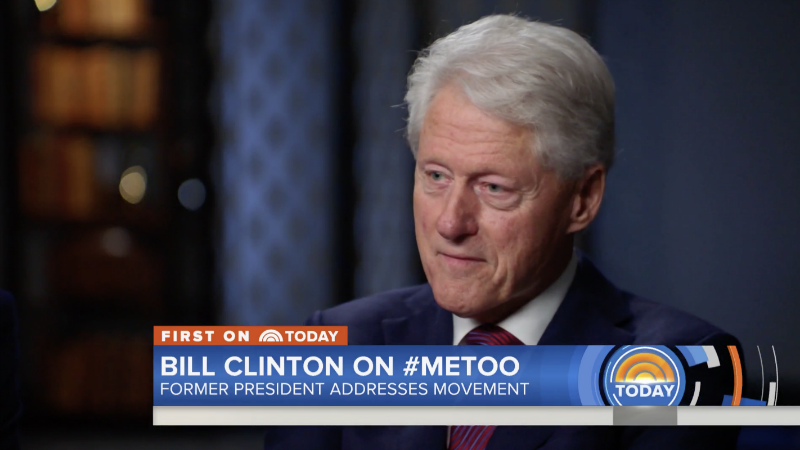 Clinton, for his part, has been repeatedly and credibly accused of assault and harassment, though he does not mention this in the interview and is not asked about it. But you [media] typically have ignored gaping facts in describing this, and I bet you don’t even know them. This was litigated 20 years ago, two-thirds of the American people sided with me. They were not insensitive to that. I had a sexual harassment policy when I was governor in the eighties. I had two women chiefs of staff when I was governor. Women were overrepresented in the attorney’s general office in the ‘70s. I’ve had nothing but women leaders in my office since I left. You’re giving one side and omitting facts. Melvin then asked if Clinton apologized to Lewinsky. Clinton says he did, likely referring to his apology in 1998 on national television, which mentioned Lewinsky and her family in passing. He has never privately apologized to her. Do you think JFK should have resigned? Do you believe President Johnson should have resigned? Someone should ask you these questions because of the way you formulate the questions. I dealt with it 20 years ago, plus, and the American people, two-thirds of them, stayed with me. And I tried to do a good job since then with my life and with my work. That’s all I have to say. Paterson and Clinton are currently promoting their joint political thriller, The President Is Missing. If only! Why Are People Still Inviting Bill Clinton to Literally Anything?